CAPE AGULHAS CLASSIC NOW OPEN FOR ENTRIES The Southernmost MTB Race & Trail Run in Africa. Entries are open for the Cape Agulhas Classic on December 21st & 22nd 2018. The event takes place over the holiday season and showcases the stunning beaches of the Overberg. Now in its sixth year, the event will offer something for riders and runners of a range of fitness and skill levels. 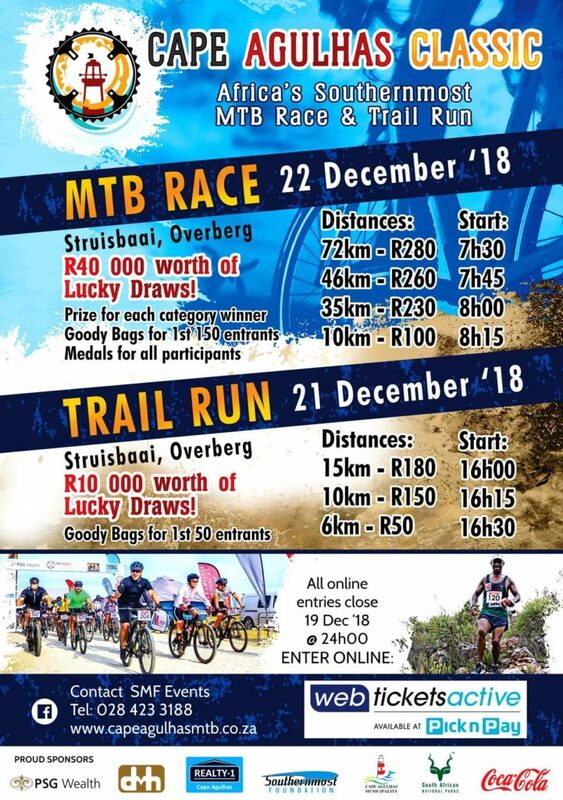 With the start and finish at NG Church Suidpunt in Struibaai, there will be four MTB distances on offer on Saturday Decemer 22nd, with the routes crossing various terrains of tar, beach and off-road trails. What a fabulous time of fun for the whole family to enjoy during the holiday season! The main mountain bike race on Friday morning is 72km, testing the skill and stamina of the rider. Then there is the scenic 46km route and the slightly downscaled 35km ride, as well as a 10km event to enjoy.